These colorful gobblers are an amusing way to brighten your Thanksgiving table, and will be especially appreciated by young guests seated at the "children's table"! Our turkey place cards are a novel way to seat guests, and are a fun take-home reminder of your Thanksgiving celebration. Reproduced from American designs which date to the 1970's, this quartet of brightly-hued cardstock turkeys are printed in bright, autumnal colors. 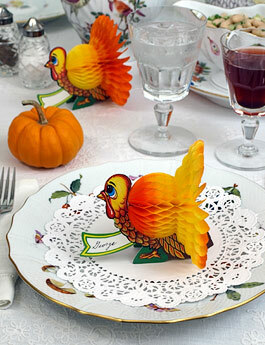 Made with fold-open honeycomb tissue paper bodies, the turkey place cards are 4" high and 4½" wide. Set of 4.